The Shaikh Ebrahim bin Mohammed Al Khalifa Center for Culture and Research is pleased to announce the launch of its Spotlight Series, a series of annual exhibitions highlighting the early modern masters of art in Bahrain. The exhibition Spotlight Series: Yaqoob Qassem launches this series with one of Bahrain’s lesser known yet extremely talented artists, whose life was tragically cut short. The Spotlight Series is a collaborative effort of the Bahrain National Museum and the Bin Matar House. The exhibition opens at the Bin Matar House on 22 May 2016 at 7pm. For years, the Bahrain National Museum has nurtured a collection of Bahraini art, building up over the years a vast compendium of well over 1,200 artworks. When it first opened its doors in 1988, the museum took over the art collection amassed by the then Ministry of Information. 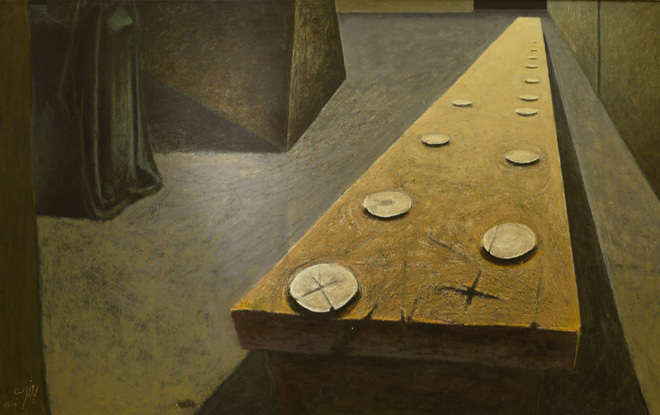 The earliest artwork in the museum’s collection dates to 1960 – by Bahraini painter Ahmed Al Sunni – and the most recent acquisition was made this year. The Bahrain Authority of Culture and Antiquities retains a keen interest in the development of Bahraini artists and each year new acquisitions are made from the pool of artists represented at the Annual Fine Art Exhibition. Yaqoob Qassem’s artworks are probably one of the smallest by number of any given Bahraini artist in the collection of the Bahrain National Museum. A mysterious figure, who died very young at the tender age of twenty-five, Yaqoob Qassem (1948-73) leaves behind very few traces yet arguably some of the most powerful and original artworks in the history of Bahraini art. The exhibition of Yaqoob Qassem’s The Last Supper series is the first in a series of exhibitions that will be held annually at the Bin Matar House, highlighting Bahrain’s early modern masters. In collaboration with the Bahrain National Museum, the exhibition spaces at the Bin Matar House will be used to display these artworks in a smaller and more intimate setting, allowing a unique focus on the individual artist. The hope is that these exhibitions will raise awareness and interest in the early masters of the artistic tradition that is still so vibrant in Bahrain today. The exhibition Spotlight Series: Yaqoob Qassem will be held at the Bin Matar House in Muharraq. The exhibition previews on Sunday, 22 May 2016, at 7pm and runs until 22 September 2016. The opening hours of the Bin Matar House are Saturday to Thursday from 9am to 1pm and 4 to 7pm. The Bin Matar House is an old traditional Bahraini building and one of twenty houses restored by the Shaikh Ebrahim Center for Culture and Research in Muharraq and Manama, Bahrain.